On September 24, 2007, our daughter, Colleen, was jogging in Pearcy, Arkansas, where she was an English teacher. When nearly two hours passed without her return, a search began. She was found in weeds eight feet from the road with broken legs and head covered with blood. It was later learned she had been hit and left by a drunk driver. The next two years were filled with near-death experiences: brain surgeries, a stroke, leg surgeries, abdominal surgeries, countless infections, and rehab centers in Texas and Arkansas. What a patient and the family go through in this kind of tragedy is unbelievable. My name is Junette (her mom) and her dad is Johnny. We stayed in her home to help her husband, Mark, and their two teenage sons. After being in rehab centers for nearly two years, we and Mark, could bring her to her home for weekend visits. When it was time to leave that center, they suggested she be placed in a nursing home. Her dad said, "Absolutely not." In December, 2009, we became fulltime caregivers for our formally feisty, happy daughter, who is now a yelling brain-injured person who doesn't move alone, think or talk well. It was not what we'd retired from teaching to do. To aide in caring for Colleen, we acquired various pieces of equipment. Her briefs are ordered in quantity, and Mark bought a handicapped van with a wheelchair lift. 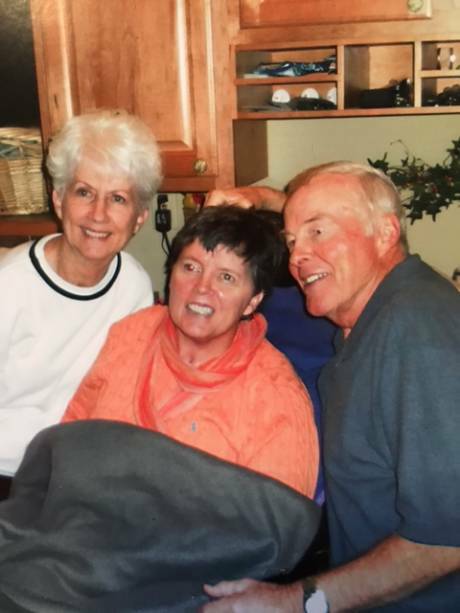 Home health and hospitals provided therapy, but in spite of all the therapies, we were told her brain won't tell her to stand, much less walk. Because of her yelling, taking her places is a challenge, but Johnny was determined she be at her sons' football and baseball games. When both boys graduated high school, we moved Colleen to our home in Harrison and remodeled our house to fit her needs. When Medicare discontinued all services, Johnny took over. Most days we stay on schedule. After her shower and breakfast, Johnny works with her, not only physical exercises, but educational activities to work her brain. Colleen uses only her left hand. She can say single words, but not sentences. When not exercising, she has favorite shows on television. My role as caregiver requires complete organization, planning, and scheduling, from meals to clothes, medicines to appointments, shopping to paperwork, etc. Caring for Colleen is difficult for a single person. Johnny or Mark help me change her and dress her, and someone needs to be with her at all times. We've had her at home for over two years now. Our reward is seeing the improvements in her, no matter how small, but the biggest reward is just having her. In the beginning, when she was critical, there was one doctor who said, "If she was my daughter, I would let her go." I said, "Well, she's NOT your daughter!"